Former England captain Steve Borthwick is excited by the ambition at Bristol ahead of his first game as forwards coach of the Championship side. 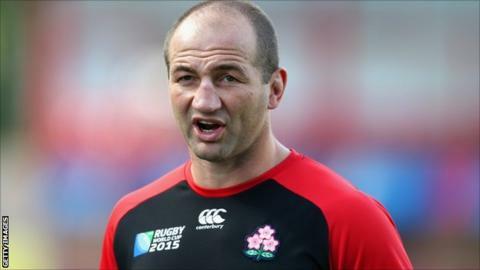 Borthwick, 36, most recently coached Japan at the Rugby World Cup, working as Eddie Jones's assistant. And he believes he can continue his coaching progression under ex-England director of rugby Andy Robinson. "The club is a big club with huge ambition," Borthwick told BBC Radio Bristol. "With Andy as director of rugby and having worked with him previously, his understanding and knowledge of the game was very attractive for me to join and work with him again. "I think also the key thing is the potential of where this club could get to. That is very attractive." Borthwick played 246 times for Bath and 144 for Saracens, also winning 57 caps for his country in a 16-year career. He retired as the Premiership's most-capped player in 2014. He feels there is the right mix of youth and experience for the club, who lead the Championship, to finally win promotion to the Premiership after back-to-back play-off final defeats. The former forward also hopes he can bring his experiences of working alongside Jones at the World Cup to the Bristol squad. "It's been a fantastic experience for me in Japan," he added. "To have played all my player career here in Europe for 16 years, to then go out and work with Eddie Jones with his experience. "He's coached in Europe, Super rugby, international rugby in both Australia and South Africa. That kind of knowledge and understanding of the game was fantastic exposure for me. "He is a tremendous coach, very fortunate to be coached by him at Saracens and work as an assistant to him."